- Manual application/release The parking brake can be applied / released manually by pulling control lever A . If this warning lamp comes on in the instrument panel, the automatic mode is deactivated. Depending on the country of registration of the vehicle, the automatic application when the engine is switched off and the automatic release when you press the accelerator can be deactivated. Activation / deactivation of this function is possible by a PEUGEOT dealer or a qualified workshop. The parking brake is then applied and released manually. When the driver's door is opened, there is an audible signal and a message is displayed if the brake is not applied. Do not place any object (packet of cigarettes, telephone, ...) behind the electric brake control. With the vehicle stationary, to apply the parking brake whether the engine is running or off, pull on the control lever A . - display of the message "Handbrake on". When the driver’s door is opened with the engine running, a beep is heard and a message is displayed if the parking brake has not been applied, unless the selector lever is in position P (Park) in the case of an automatic gearbox. Before leaving the vehicle, check that parking brake warning lamp in the instrument panel is on, not flashing. With the ignition on or the engine running, to release the parking brake, press on the brake pedal or the accelerator, pull then release the control lever A . - display of the message "Handbrake off". If you pull the control lever A without pressing the brake pedal, the parking brake will not be released and a warning lamp will come on in the instrument panel. If necessary, you can make a maximum application of the parking brake. It is obtained by means of a long pull on the control lever A , until you see the message "Handbrake on" and a beep is heard. - when the gradient you are parked on is variable in its effect (e.g. on a ferry, in a lorry, during towing). In the case of towing, a loaded vehicle or parking on a gradient, make a maximum application of the parking brake then turn the front wheels towards the pavement and engage a gear when you park. After a maximum application, the release time will be longer. 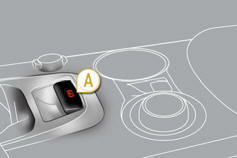 With the vehicle stationary, the parking brake is automatically applied when the engine is switched off. An audible signal will confirm to you the application/ release of your electric parking brake. Before leaving the vehicle, check that parking brake warning lamp in the instrument panel is on (not flashing). Never leave a child alone inside the vehicle with the ignition on, as they could release the parking brake. In the case of towing, a loaded vehicle or parking on a gradient, turn the front wheels towards the pavement and engage a gear when you park. The electric parking brake releases automatically and progressively when you press the accelerator: Manual gearbox: press down fully on the clutch pedal, engage first gear or reverse, press on the accelerator pedal and move off. 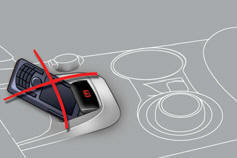 Electronic gear control gearbox : select position A , M or R then press on the accelerator pedal. Automatic gearbox: select position D , M or R then press on the accelerator pedal. When stationary, with the engine running, do not press the accelerator pedal unnecessarily, as you may release the parking brake. With the engine running and the vehicle stationary, in order to immobilise the vehicle it is essential to manually apply the parking brake by pulling on control lever A . When the driver’s door is opened, an audible signal heard and a message is displayed if the parking brake has not been applied, unless the selector lever is in position P (Park) in the case of an automatic gearbox. In certain situations (e.g. starting the engine), the parking brake can automatically alter its force. This is normal operation. To advance your vehicle a few centimetres without starting the engine, but with the ignition on, press on the brake pedal and release the parking brake by pulling then releasing control lever A . The full release of the parking brake is confirmed by the warning lamp in the control lever A and the warning lamp in the instrument panel going off and the display of the message "Handbrake off". If a parking brake fault occurs while applied or if the battery runs fl at, an emergency release is always possible.